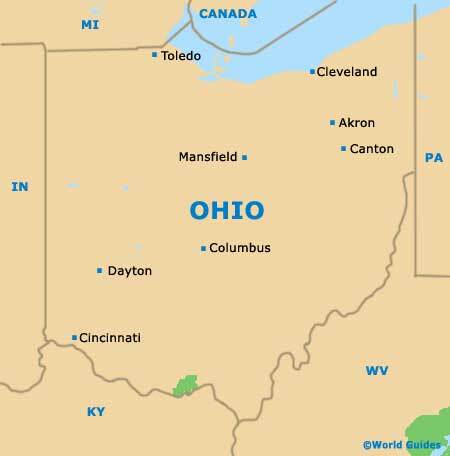 Ohio is handily situated between the northeast USA and the Midwest. It means that wherever you happen to be in the state, you are within a day's drive of half of all American people. As you would expect, Ohio has a very well-developed road network. The state itself is also neatly sandwiched between Lake Erie and the Ohio River. If you talk about going 'toward the lake', it means you're heading north. On the other hand, going 'toward the river' means that you are on the road south. At first glance, Ohio seems like a pretty average US state, with none of the really big tourist attractions you get elsewhere. That's where you'd be wrong. For a start, there's Cedar Point, billed in the business as the 'Best Amusement Park in the World'. Based in Sandusky, it is also the second-oldest amusement park in the US. It keeps thrill seekers well and truly entertained with its record-holding 70+ rides, more than 15 of which are rollercoasters. Central Ohio is also home to the world's largest Amish community. The sight and sound of horse-drawn buggies clip clopping through the countryside never fails to turn heads. As a tourist attraction, the state's Amish community is not as well-developed as that found in Pennsylvania, which serves to add to the experience. Ohio is often called the 'Mother of Presidents', because no less than eight of America's presidents were actually born here. In 2004, this state also helped to seal the fate of US politics when it was the last state to be counted and, thus, had the deciding vote. Often nicknamed 'Cincy' by Americans, the city of Cincinnati lies next to the Ohio River and features attractive Art Deco buildings, riverfront districts, plentiful museums, a stunning fountain and a distinctive network of elevated skywalks. Cleveland's tourist industry has expanded greatly over recent years and the city has become a major tourist destination. Standing in the state of Ohio, on the Lake Erie shores, the city's waterfront area forms an impressive skyline. Columbus is a vast city and capital of Ohio (OH) state, in Franklin County located next to the Scioto River. The city's namesake is Christopher Columbus and highlights include Ohio State University (OSU) and the German Village district.